For the next few posts we will be touring the Paddington and Bardon areas. Richard Gailey designed this building, built back in 1883/4, and I think that he would be quite surprised to see it now. It has had a number of incarnations, and the more recent ones are very different from its original purpose. Gailey's brief was to design a lodge for the Manchester Unity Society of Independent Oddfellows. As you may tell from the name, Oddfellows Societies were first formed in England, and they were a kind of community-based insurance scheme where members combined to provide funds for those who might suffer illness or injury. Manchester Unity commenced in Manchester in 1810, so there was a Manchester Unity long before there was a Manchester United :-) When I first started work, I joined the Manchester Unity health fund and was a member for 20 years or so. They are still a presence, as part of the large HCF Group. Anyway, they met in this hall until 1916, moving then into the BAFS building in the city. The Society had always had tenants in commercial shops on the ground floor, but following the downturn of the 1890s, eventually had to lease the entire premises out to improve their financial position. 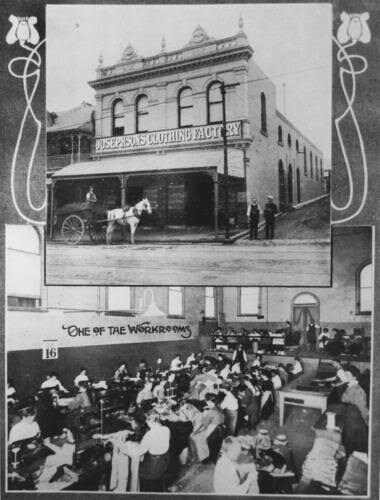 In 1909, the shops and the hall were leased to young businessman Isidore Josephson, who came up from St Kilda in Melbourne at the age of 21 to establish a clothing factory, thereby employing many local workers. Josephson was innovative, introducing electric machines to increase efficiency. The photo below is from around 1910, and shows the signage for Josephson's factory on the exterior of the building, as well as one of the interior workrooms. The Oddfellows sold the building to the Labor Party in 1928, and they continued to lease it to Josephson's company until 1936, although Isidore himself died in 1933. After they left, the building was vacant until about 1949 except for the war years when it was used by the Defence Department. 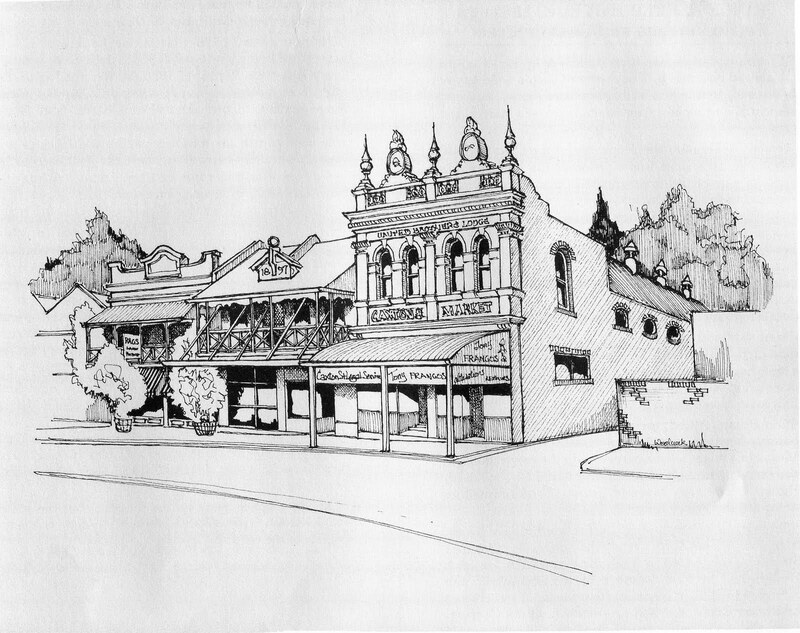 In 1949 the building became the Baroona Labor Hall, and one of the shops in the front was occupied by a tailor. 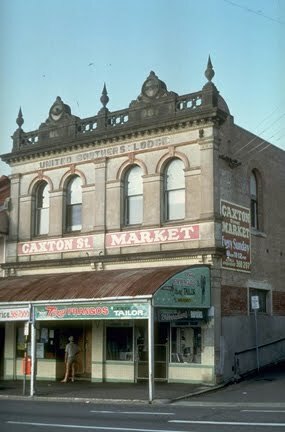 During the sixties this building fell into disrepair, but then in 1976 it became home to the Caxton Street Legal Service who occupied it until 1988 when they moved to New Farm. The hall stood empty again until 1990, when it was converted to use as a nightclub. 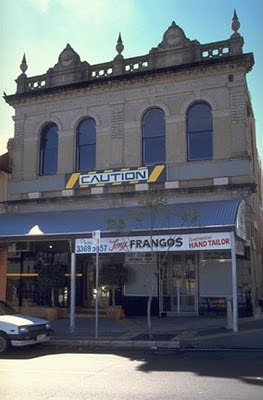 The photo of the hall as a nightclub (above) is from 1996, and the undated one below shows it as a market. I took a photo of it recently, and it is shown above. I didn't know who the tenant was at the time I visited, so I Googled it later. I was surprised to find that The Velvet Cigar is an adult nightclub - think Moulin Rouge - burlesque shows and all that. Imagine how surprised Richard Gailey would be! I also note that the next-door building from the original photo is still present in my recent photo. The sign on it says 1897. This has now turned into a trendy bar called Leftys. There you go. It's full of people I like to call 'beard bros'.